Quarantine importance: None. 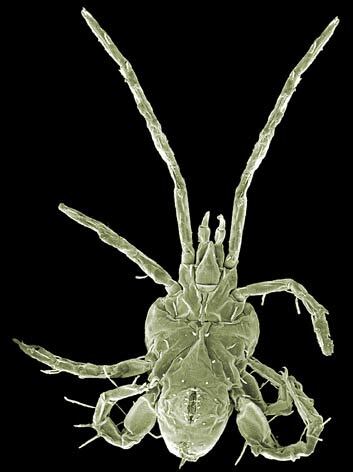 These mites are rare and of no known quarantine importance. Diagnosis. Primitive mites related to the Parasitiformes and resembling small opilionids. Soft-bodied, grey-blue to lilac in colour, usually with white bands or stripes. Peritremes absent; opisthosoma bearing four pairs of dorso-lateral spiracles (adults and tritonymphs); prosoma with 2-3 pairs of lateral ocelli; gnathosoma bearing >4 pairs of ventral setae, rutella and With�s organ; chelicerae 3-segmented, with 3-5 setae and 2 lyrifissures on middle article; palps with 5 segments and well developed claw; tritosternum unfused, with finger-like processes; coxae free; trochanters III and IV divided; all pedal tarsi divided. Similar taxa. 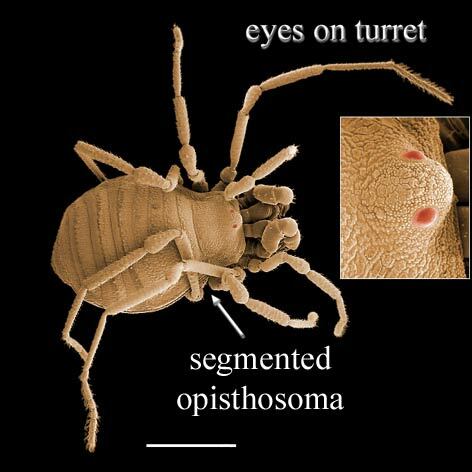 Opilionida (harvestmen) which have segmented opisthosomas and eyes (when present) on a median turret, and Eupodidae (Prostigmata), which have 2-segmented chelicerae, genital papillae, and often have swollen femora IV for jumping. The only known Australian representative of the group is currently undescribed, but has been collected in the Kimberleys, Kakadu, and Far North Queensland. Ecology & Distribution. Predators and scavengers in Mediterranean and tropical habitats including rainforest litter and caves. Australian opilioacarans can be found under rocks in mesic gullies in dry, tropical habitats. Adults are less than 3 mm in length, purplish brown with white striped legs, fast moving, and feed on pollen, fungi, and small arthropods. Grandjean F. 1936. Un acarien synthetique: Opilioacarus segmentatus With. Bulletin, Soci�t� d'Histoire Naturelle de l'Afrique du Nord 27: 413-444. Hammen L van der. 1966. Studies on Opilioacarida (Arachnida). I. Description of Opilioacarus texanus (Chamberlin and Mulaik) and revised classification of the genera. Zoologische Verhandelingen 86: 1-80. Hammen L van der. 1968. Studies on Opilioacarida (Arachnida). II. Redescription of Paracarus hexophthalmus (Redikorzev). Zo�logische Mededelingen 43: 57-76. Hammen L van der. 1969. Studies on Opilioacarida (Arachnida). III. Opilioacarus platensis Silvestri and Adenacarus arabicus (With). Zo�logische Mededelingen 44: 113-131. Kaiser T and Alberti G. 1991. The fine structure of the lateral eyes of Neocarus texanus Chamberlin and Mulaik, 1942 (Opilioacarida, Acari, Arachnida, Chelicerata). Protoplasma 163: 19-33. Klompen JSH. 2000. Prelarva and larva of Opilioacarus (Neocarus) texanus (Chamberlin and Mulaik) (Acari: Opilioacarida) with notes on the patterns of setae and lyrifissures. Journal of Natural History 34: 1977-1992. Walter DE and Proctor HC. 1998. Feeding behaviour and phylogeny: Observations on early derivative Acari. Experimental & Applied Acarology 22: 39-50.